Command of the army of Sparta included the commanders of units that are divided Spartan Army: polemarh - commanders of the Mora (500-900 people), lochag (captains) - commander of the Loch (150-200 people), pentekoster - commander of Pentecost (50-70 people) and enomotarh - commander Enomoties (25-35 people). A special place among the Spartan commanders took garmost, appointed as garrison commander Lacedaemon or nearby islands. The High Command of the Spartan army carried out one of the two kings. Polemarh were immediate entourage of the king and his council of war. Constantly being around the king, they were with him ate and were present at sacrifice. When the king had a selective detachment of the guard of the 300 finest warriors. Three commander (gippagret) of this order are also included in the inner circle of the king. Military commanders were elected at a meeting of soldiers on the proposal of the kings of the Spartans. In office depended on the will of the king, as commander in chief. During the battle, all the commanders took place on the right flank of their unit, and the king was on the extreme right flank of order of battle (phalanges). Warlord is the hallmark of cross-red-black hair crest on the helmet. Corinthian type helmet itself is made of bronze and decorated with images of a sheep's head on the cheeks plates. From under the helmet visible strands of long hair, characteristic of lakedemonskoy military aristocracy. Chiton and cloak-mantle traditional for the Spartans, blood-red color. The body protects Breastplate made of several layers of linen (linotoraks). This type of armor replaced the heavy bronze muscle cuirass. Argivsky Round Shield (goplon) made of wood and covered with a thin sheet bronze. On the inner side panel pasted leather, equipped with a central bronze bracket, as well as colored lace to hold the shield hand. 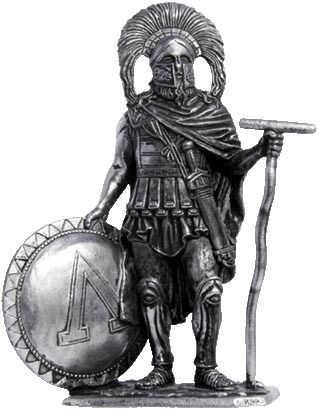 The emblem on the shield is a red letter "L" (lambda), denoting Lacedaemon and is an emblem of Sparta. In his left hand holds the typical warrior lakonsky Staff - bakterion. This wooden stick was not a weapon and was used by warlords and noble Spartans as a symbol of the power of Sparta.